Here's a new topic to cover U2 and other guitar related questions. Sound good? 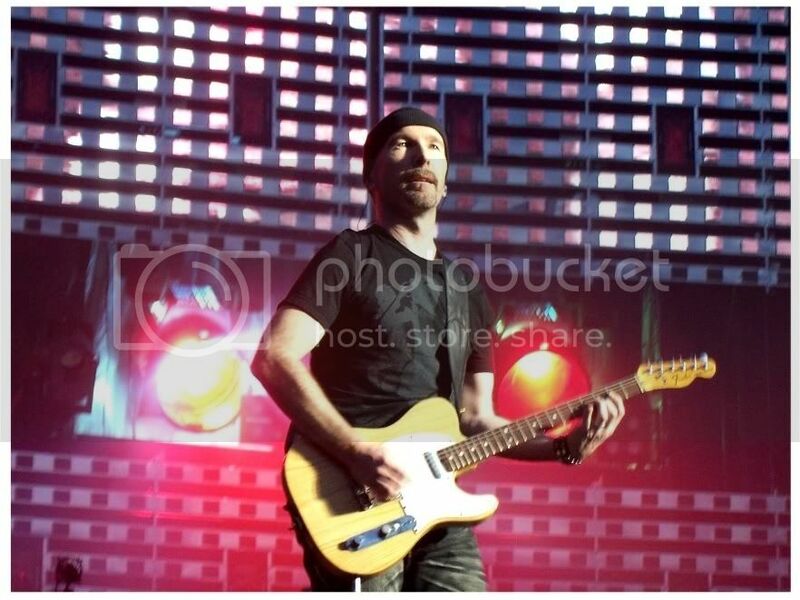 This piccy is of Edge playing his Ash Telecaster not the normally seen `66 Cream Tele. I have to double check as to what show that piccy is from. I don't think that the ASH Tele was used often and was probably the 'backup' for the cream Tele. Perhaps the cream Tele had the night off for some Dallas Schoo repairs? Another in a laundry list of questions for Mr. Schoo. why the feck can't he (supposedly) work out the sound to Ultraviolet again? I know, I know... many prefer the 'Fireglo' finish Rickenbacker to that of The Edge's `66 Mapleglo. I felt the same way but have grown to love the Mapleglo too. Note the red markings near the control knobs. Now YOU TOO (U2 !!!) can set your Rickenbacker 330 12-string to the same volume and tone settings as The Edge !!!! BY THE WAY... I am pretty sure that The Edge used his "Jetglo" (black) Rickenbacker for the TV spot of "Windows In The Skies" that aired on Japanese TV in 2006. Anyone have a good piccy or screen cap of this? Originally posted by germcevoy why the feck can't he (supposedly) work out the sound to Ultraviolet again? Edge has said that it's a hard song to play and get right live. Perhaps, but they sure did a bang up job during the ZOO tours. Just to say (in case it's what you thought, if it isn't I apologise ), I didn't mean I don't understand the whole tuning lark (i.e. I know most guitars are in standard tuning - unless of course you meant most of Edge's guitars are in standard E), I myself tune all my guitars to Eb because I'm perfectly comfortable with sticking the capo on the 1st fret, but a lot of my friends seem to have trouble using capos lol!). PS: since you brought it up lol, open E - is that as in where the strings are tuned to the chord of E, e.g. for slide guitar? I was interested to read about what you said re. ISHFWILF, I always wondered how they worked out the guitar part because I remember it was one of the songs I first tried to learn when I took up guitar (chords I mean, rather than the actual bit Edge plays live - I only worked out how to play that a couple of months ago! ), but it irritated because I worked out the song itself was in Db, but at the time I hadn't encountered alternative tunings and capos etc.! As ever Jeff, you throw up some great bits of info! No worries and no offense. Like I've said, how I learn more is when people ask questions which point me in a direction to research. And hey, there is a good chance you are right about M. Ways being in "E"! I will check when I get home. No worries, there is no 'kerfuffle' just discussion and trading of information. And that ain't a bad thing. I also used to tune my guitar to E-flat and simply capo at the first fret for anything in E. (being that I like play along to U2 DVDs and such...) That was how I did things when I only had one electric and an acoustic... now that I've a few more... I've had them set up to be tuning specific. - My Clapton Strat is in E flat. - My 6-string Ric is tune (low to high) D-A-D-A-C-E, as I've wrote a few tunes in that tuning. - My 6-string Danelectro is in Open D (which I can also capo at the 2nd fret for open E, ala many tunes on Bob Dylan's "Blood On The Tracks". - My 12-string Danelectro is in E-flat. - My 12-string Gibson J185 acoustic is in E-flat. - I change the tuning of my Taylor Big Baby and Washburn EA20 all the time. I wasn't sure how to play "I Still Haven't Found..." for a bit. 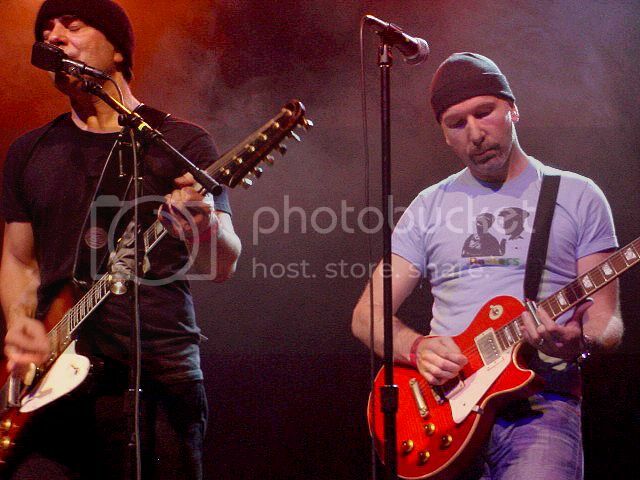 Then I saw Edge play with Danny Lanois, in Hollywood, in June 2003. Anywho... I was 3 feet away from The Edge and got to see how he plays it. He's playing slide on Danny's "Still Water" in the picture above. They played "Falling At Your Feet", "Still Water" (Edge playing Slide) and then "I Still Haven't Found...". 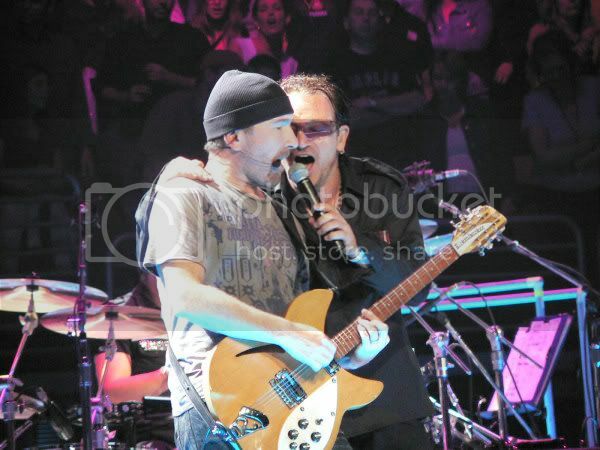 I am not sure if that Les Paul in the piccy is one of Edge's, one of Danny's or borrowed/rented for the show. I will have to ask about that too. When I bring my laundry list of questions for Edge and Dallas... I will need to bring them lunch too, as they will be there a while - its a long and growing list !!! ...I also used to tune my guitar to E-flat and simply capo at the first fret for anything in E. (being that I like play along to U2 DVDs and such...) That was how I did things when I only had one electric and an acoustic... now that I've a few more... I've had them set up to be tuning specific. 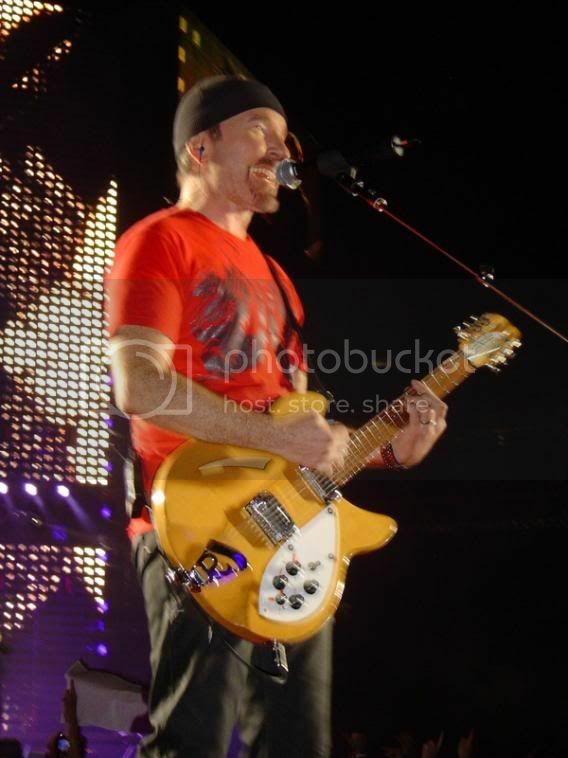 The Edge has played "All I Want Is You" on one of the many Stratocasters, for the most part but there have been occasions where he's used a Gretsch Country Gentleman and it sounds great. The Omagh Tribute show comes to mind. But I can see where you'd prefer the tone of a Strat-like guitar to a Les Paul. Indeed, I just find the thinner tone of the singles suits the actual tone, i.e. the relatively clean delay effect. When I run it through the Epi., it crackles at random points and muffles up too much for my liking but I do remember watching that tribute show recently and noting that he used a Gretsch. Edge doesn't actually play with the purple ones. The blue one was Edge used, as can be seen by the wear. Does Edge play them back to front or something? I noticed on the blue pick you have that the "grip" area looks scratched up compared to the point which seems pristine. I think I read it somewhere else before, but do you know anymore about how he actually holds picks? Yep, playing with the grip side striking the strings is THE "Secret of the Edge Ching". Do you play the same way when playing U2 stuff then, per chance? Or do you just play however your technique goes?